Ever since John Gill introduced the use of gymnastics chalk to the sport back in the 1960s, chalk has been a part of the sport for the vast majority of climbers. In bouldering chalk is a crucial piece of equipment since poor friction can easily negate the strongest effort. Over the past six months I have been trying out various chalks sent by manufacturers or purchased by me to see what if any differences there are between brands. In part this was prompted by some encounters with uneven batches of Metolius Super Chalk last year that had me wondering whether I was using something that was actually hindering my climbing. I sent off emails to various manufacturers and received samples from Black Diamond, Metolius, So Ill and just recently received some product from my sponsor Moon Climbing. I also purchased some chalk under the Bison, Wild Country and Asana brands. My testing protocol is anything but systematic, involving trying the stuff out on various rock types including local sandstone, RMNP gneiss and plastic holds in various gyms. According to information supplied by Metolius Climbing, chalk comes from mining deposits of limestone and dolomite which is then "processed into a variety of products, one of them being climbing chalk or magnesium carbonate." The chalk is purified, dried, and crumbled to a climber-friendly consistency before being packaged for distribution and sale. Metolius continues, "Depending on the manufacturer, some additives to aid in moisture absorption can be added to the chalk prior to packaging. Metolius additives are a food grade product." When I started climbing the only choices were various forms of block chalk, most famously that marketed by Frank Endo. By the late 1990s designer chalk had emerged, most famously Metolius Super Chalk. At present there are at least the brands mentioned above as well as Petzl, and no doubt many more, including liquid chalk. There is more than an even chance of branded chalks leaving the same factory under different labels but surprisingly, differences between certain brands did emerge. What am I looking for in a climbing chalk? Two primary qualities stand out: texture, especially a frictiony feel, and drying capacity. Texture is a subjective quality but there is a tendency in some chalks to have a smooth talc-like feel, something which I find is detrimental to a confident grip on the holds. The chalk should have just a bit of grit to it, in my view. Then there is drying capacity. Chalk is hygroscopic, meaning it absorbs water from the atmosphere and from your fingers. This gives your fingers better adherence to the rock, but only up to a point. It may seem counter-intuitive but chalk should not entirely dry your hands out. Ask around and you may find that climbers will describe conditions that are too dry, where fingers suddenly snap off from holds in what is commonly called "dry-firing." For fingers to adhere well to rock, they have to have a little bit of give on the surface and hard glassy finger tips can be a liability. You may want to lightly dampen your tips and sand down any callouses for a better grip on cool dry days, especially if your fingers are naturally dry as mine are. Chalk that is too dry or contains drying agents may actually be counterproductive in these conditions. More and more I find that manufacturers are opting away from drying agents and offering chalk that is 100% magnesium carbonate. The criteria I use for judging chalk quality are "hand feel," consistency, and moisture content. A good chalk in my view should have a slightly gritty feel, be reasonably chunky in consistency, and be just a bit moist. 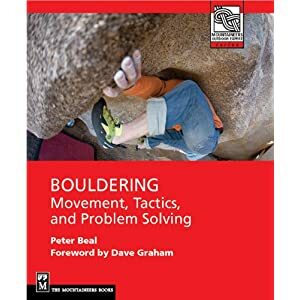 For bouldering in very dry conditions, such as are typical in Colorado, these characteristics are desirable. For bouldering in Alabama in June, a drier chalk with a drying agent may be desirable. So which chalks were the best performers? For me, there were three standouts. Black Diamond White Gold Loose Chalk was excellent, a bit dry but with very good texture and consistency. The refillable canister is a sensible idea as well. I was also impressed by the feel of the Wild Country Pure Chalk which seemed to coat my fingers well with an initially damp layer that dried quickly to a sticky finish. Moon Climbing's Moon Dust seemed to sit between the two, with an excellent consistency and dry gritty feel, though softer than the Black Diamond brand. Less desirable to my mind though still reliable were the Metolius block chalks and Super Chalk. These, the Asana White Dirt and So Ill's Prescription Chalk tended to have a more soft talc-like feel and did not adhere as well to my skin during problems. The least desirable of the chalks I tested was Bison Chalk which had an almost slippery feel to it, reducing friction compared to the other varieties. My advice is to try out a number of different brands and see if they work well for you. The statement that "chalk is just chalk" is not exactly true. I should add that I did not test the chalk ball options that are available as I have never liked them. A thoughtful and careful approach to applying loose chalk can reduce any extraneous dust issues. Some gyms require them but given the propensity for kids to throw them at each other, I am not sure that rule actually pays off. A final thought. Chalk should be used sparingly and only to get the skin prepared for climbing. There is a point at which chalk becomes detrimental, interfering with the contact between skin and rock, so do not simply pile chalk onto holds. Never apply it to footholds. And please erase your tickmarks and scrub the holds clean after you are done with a problem and bring the rock as close as you can to a natural state. Thanks again to the manufacturers and sales reps who assisted in providing product and information! I am giving another clinic this Wednesday evening at the Spot from 5:30 to 6:30. The last one was booked solid and I expect a similar turnout again. As the weather starts getting warmer, I am looking forward to returning to the alpine sites of Evans and RMNP and if you are looking to get the most out of visits up there, this might help. Call the gym at 303 379-8806 to get on the signup sheet.